It's difficult to be certain yet but, based on information obtained on the Voyager and Galileo missions, scientists suspect that inside Europa, one of the icy moons of Jupiter, there exist reservoirs of liquid. The Voyager and Galileo missions also registered fractures and `chaotic´ terrains associated to reddish materials, which contrast with the glacial white of the dominant water ice of the surface. Some of these geological structures would seem to be related to the rise of fluids coming from inside. Data also suggest that red materials are hydrated salts, mainly of magnesium sulfate (MgSO4). Volatile compounds like carbon dioxide (CO2), sulphur dioxide (SO2) and hydrogen peroxide (H2O2) have been also detected. This combination of water, salts and gases dissolved in such a huge ocean below Europa´s icy crust could rise to the surface generating the enigmatic geological formations associated to red-tinged materials that can be seen on this Jupiter's satellite. This is confirmed by the experiment carried out in the laboratory with water, carbon dioxide and magnesium sulfate by researchers at Centro de Astrobiología (CAB, Spain). This shows Lenticulae terrain on the surface of Europa. Reddish spots and shallow pits pepper the enigmatic ridged surface of Europa in this view combining information from images taken by NASA's Galileo spacecraft during two different orbits around Jupiter. Credit: NASA/JPL/University of Arizona/University of Colorado. 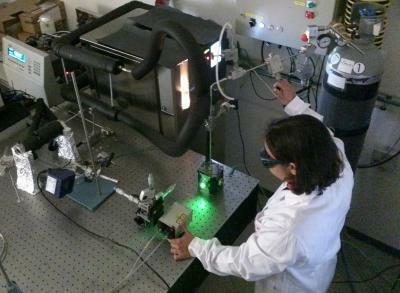 With all these premises, researchers at Centro de Astrobiología (CAB, INTA-CSIC) have developed an experiment to explain how these fluids evolve in their way between the deep reservoirs and the moon's surface. "Just like Earth's magma emerges to the surface, a similar phenomenon could occur in Europa. Although, in this case it would be a watery cryomagma that would evolve and emerge outwards from the interior of the icy moon," says Victoria Muñoz Iglesias, one of this work's authors, published in the journal Geochimica et Cosmochimica Acta. To test their hypothesis, the scientists have simulated in the laboratory the extreme conditions of the fluid reservoirs in the crust; particularly the high pressure (reproducing up to 300 bars) and the low temperature (around -4 ºC). They have observed what happens to an aqueous solution with CO2 and MgSO4 from these conditions when it emerges and cools to the surface. The result is a variety of processes similar to Earth's volcanism, but at temperatures below zero. Three types of minerals are formed depending of the fluid's evolution: water ice, clathrates of carbon dioxide and very hydrated magnesium sulfates (epsomite, meridianiite). "These crystallization processes are exothermic (they release energy); they also produce volume changes inside the crust, when the cryomagma solidifies," says Victoria Muñoz-Iglesias. "If in the final mineral assemblage the quantity of clathrates is less than that of hydrated salts, the volume increases causing positive topographical features and fracturation in the crust. However, if the proportion of clathrates is bigger than the rest of solids, or these phases are destroyed releasing the gas, volume decreases and the terrains above might collapse. Some of the chaotic terrains of Europa´s surface could have been produced in this way". The researcher indicates that at present the reddish colour of these formations is explained as produced by the alteration of the salts due to the strong irradiation of Jupiter's charged particles, forming sulfurous compounds. Other theories point to the bombardment of sulphurous elements coming from volcanic emissions from the neighbouring satellite Io. "Either way, our experiments show that certain characteristics of Europa´s surface regarding its composition, morphology and topography might be explained if a saline aqueous medium is involved, which has important consequences for living beings on Earth," concludes the researcher. 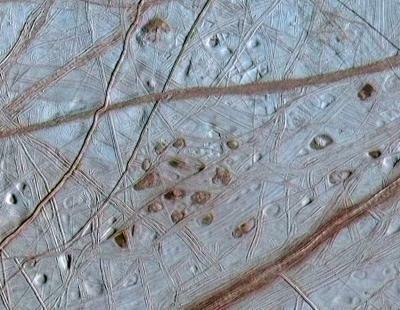 Europa is one of the best candidates for life in the solar system. Actually, president Barack Obama presented NASA's budget for 2015 including an item for 15 million dollars to look for signs of life on this moon in the next decade. The European Space Agency (ESA) also plans to launch the JUpiter ICy moons Explorer mission (JUICE) in 2022. When the spacecraft arrives at its destination, the icy moons of Jupiter, in 2030, it will fly over Europa two times to measure the thickness of its mysterious crust and explore its habitability.